Statisticians Mirko Jalava (FIN) and A. Lennart Julin (SWE) continue their ‘End of Season’ event category reviews, which cover all Athletics disciplines, highlighting the best performances which have taken place across our sport in 2012, with the THROWS. The Shot Put season started, like so often happens, with a strong showing by the Americans and 26-year-old Ryan Whiting proved that his good results do not just come in his home country by winning at the IAAF World Indoor Championships in Istanbul with a personal best of 22.00m, his longest throw ever either indoors or outdoors. However, Whiting’s good form did not carry on for many more months and his best outdoor performances came early in the summer. By contrast, and still just 22, Germany’s 2011 IAAF World Championships gold medallist David Storl seems to be one of those throwers who know how to time their peaks to perfection despite the fact that there are several big meetings to target. Indoors, he achieved an indoor best of 21.40m in his last meet prior to going to Istanbul at the German national championships. Once at the World Indoor Championships, he then produced another personal best of 21.43m with his first throw in qualifying and continued that with another best of 21.88m in the first round of the final, and that was enough for the silver medal. Outdoors, Storl went to the European Athletics Championships in Helsinki with a season’s best of 21.13m but beat that with his first throw of 21.19m in the final before winning his first European title with a distance of 21.58m. At the Olympics, most people were anticipating the Chemnitz athlete’s first effort in the final and he didn’t disappoint there either. Having again qualified with his first throw, just like in Istanbul and Helsinki, he opened the competition with an outdoor personal best of 21.84m and beat that in the second round with a toss of 21.86m. It was not enough to win as Poland’s 2008 champion Tomasz Majewski also found his best form in London but Storl took home a silver medal from his first Olympics. The 31-year-old Pole had a season lot like his younger German challenger. He had a 2012 best of 21.27m before the World Indoor Championships but he beat that result three times in the final to take the bronze medal with a national indoor record of 21.72m. Moving outdoors, Majewski quickly found his rhythm with second place at the Samsung Diamond League meeting in Eugene, with a season’s best of 21.60m, and then produced a win in Oslo with 21.36m. Majewski then passed the European Athletics Championships to concentrate on the Olympics. Just like Storl, he was like a different athlete in London, throwing 21.72m in round two of the final and then taking the lead in the next round with another season’s best of 21.87m, before clinching his second Olympic title with his last throw of 21.89m, a season’s best and just six centimetres short of his 2009 national record of 21.95m. Americans have won an Olympic medal in the Shot Put in every Olympic Games since Los Angeles 1984 and this year was no different although they might have been expecting to get more than just a bronze medal as they have the first two on the 2012 world list,. Reese Hoffa, the 2007 World Championships gold medallist, was third in London but his best of 21.23m there left him well in arrears of Majewski and Storl while 2012 world leader and 2008 Beijing bronze medallist Christian Cantwell was fourth with 21.14m. United States is the top nation in this event with 26 athletes in the world top 100 while Russia have 10 men for the second place. Robert Harting is the undisputed number one in this event at the moment. 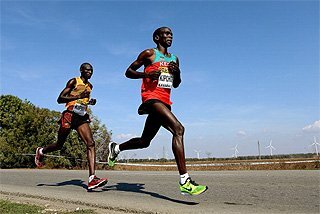 The 28-year-old’s German’s only defeat in a major championship since his 2009 World title was at the 2010 European Athletics Championships, where Poland’s Piotr Malachowski grabbed the win. Harting has since won at the 2011 World Championships, the European Athletics Championships this summer, and triumphed in a really tight Olympic final in London. The Berlin athlete also had a perfect 2012 campaign with 12 wins in 12 contests and threw over 70 metres twice within the space of three days in May. He first threw 70.31m in the German town of Halle, the first 70-metre throw of his career, and then a 2012 world leading mark of 70.66m at the Ludvik Danek Memorial in Turnov, Czech Republic. Following his 68.30m triumph in Helsinki, Harting didn’t compete again before London, where he was challenged by Iran’s 27-year-old Ehsan Hadadi. Hadadi hit a 68.18m throw in the first round to lead, with Harting opening with 67.79m. The German finally got in front in round five, winning the Olympic title with a throw of 68.27m. There was a big fight for the bronze in London as Lithuania’s Virgiljus Alekna, now 40 but the Olympic champion in 2000 and 2004, held on to the bronze medal position until the fifth round before Estonia’s 2008 Olympic champion Gerd Kanter passed him with a 68.03m season’s best for the bronze medal. Alekna finished in fourth place with 67.38m and also achieved his 20th competition over 70 metres this season with a 70.28m season’s best on home soil in Klaipeda in June. This season also saw two new European names rise close to the top. Great Britain’s 21-year-old Lawrence Okoye, a very promising rugby player as a teenager, beat his own British record of 67.63m from last year with 68.24m in Halle. He reached the final at both the European Athletics Championships and at the Olympics, finishing in 12th in both competitions. Germany’s Martin Wierig, 25, threw a personal best of 68.33m in July and then placed sixth at the Olympics. United States is the best country in this event with 15 athletes in the world top 100 with. Great Britain and Germany tied for second place with six each. Global success seemed to avoid Hungary’s Krisztian Pars until this year. 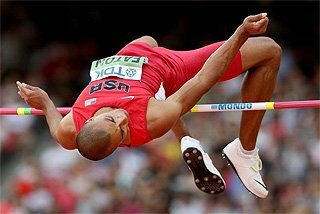 The 30-year-old has been at the top of his event since 2004 and has entered many major meets as one of the favourites, but he always fell short. 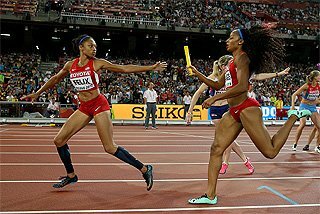 However, a bronze in Barcelona at the 2010 European Athletics Championships and then a World Championships silver medal in Daegu last year were steps in the right direction and the 2012 season was a nearly perfect with only one loss in 16 starts. At the European Athletics Championships, Pars took the lead in round one with 78.57m and nobody else had an answer before he improved later in the competition to 79.72m. The same script was in use in London with Pars opening with a good 79.14m to immediately take the lead. Although Slovenia’s 2008 Olympic champion Primoz Kozmus was close behind with 78.97m, Pars became the only athlete to reach 80 metres in the competition when he sent his hammer out to the winning distance of 80.59m in round three to win an Olympic title after fourth place in both 2004 and 2008. Kozmus made a successful comeback after a short retirement and threw a season’s best of 79.36m for the silver medal while Japan’s 38-year-old Koji Murofushi finished third in an otherwise quiet season. 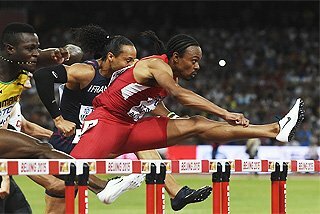 The 2004 Olympic champion and reigning World champion from Daegu had only competed once in 2012 prior to the Olympics, winning the Japanese title with a modest 72.85m, but in London he showed that he’s still among the very best with a 78.48m season’s best in the qualification followed by 78.71m in the final. Poland’s 23-year-old Pawel Fajdek was the only athlete to beat Pars during the season when he won in Montreuil, France, with a sixth round effort of 81.39m, a personal best, but he crashed out in the qualification rounds in London with three fouls. Belarus is the best country in this event with 11 athletes in the world top 100 followed by Russia in second place with 10. With Norway’s Andreas Thorkildsen and Finland’s Tero Pitkämäki unable to find their best form this summer, the 29-year-old Czech Vitezslav Vesely stepped up and was the number one thrower at the start of the season. Vesely only suffered two losses in eight competitions before the Olympic Games, including winning at the European Athletics Championships. Although the final in Helsinki was rather lacklustre, with none of the favourites able to find a really good throw, Vesely did enough to win his first major title with 83.72m. He then sent his implement out to a world-leading 88.11m at the Samsung Diamond League meeting in Oslo and he reached 88.34m in the Olympic qualification round, making him even a bigger favourite for the final. What happened in the final though was nothing short of sensational with the19-year-old Trinidad and Tobago thrower Keshorn Walcott taking the gold medal. Walcott started 2012 with a personal best of 75.77m from October 2011 but he quickly progressed and unleashed his first 80-metre throw in Havana, Cuba, in late May before improving further at Caribbean Junior Championships in July with a huge 82.83m personal best. He then won at the IAAF World Junior Championships in Barcelona with his last round throw of 78.64m. However, no one could have predicted what would happen in London. First, the teenager qualified for the final with his last throw of 81.75m; he then surprised the whole field with his 83.51m opener in the final before a national record of 84.58m with his second throw. Amazingly, it was good enough for the gold medal. 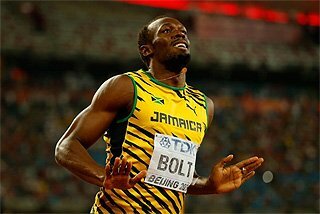 Walcott became became his country’s first Olympic champion since Hasely Crawford won the 100m in 1976. He also became the first athlete to win World junior and Olympic titles in an individual event in the same year and is only the second non-European Olympic champion. Ukraine’s Oleksandr Pyatynytsa was in great shape early in the summer with 86.12m in his first competition back in May but could then only finish fifth at the European Athletics Championships. However, he bounced back with a good win in the Paris Diamond League meeting, throwing 85.67m, and then took the Olympic silver medal with 84.51m. With all of the favourites failing in London, there was a surprise bronze medallist too. Finland’s Antti Ruuskanen only narrowly made it through the qualifying rounds and didn’t start the final much better, but threw 84.12m in round three for third place. What happened late in the season was all about the Finnish throwers. Pitkämäki suddenly found a vein of good form, winning in Stockholm with 86.98m then Ruuskanen was the next to shine and reached a 87.79m personal best for the Finnish national title, the first of his career, before Pitkämäki ended the season with good wins in Zürich with 85.27m and in the traditional match against Sweden in Gothenburg with 86.86m. Andreas Thorkildsen, the winner at the 2004 and 2008 Olympic Games, the 2006 and 2010 European titles and the 2009 World champion was not his usual self in 2012. Good throws were few and far between. His disappointing fourth place finish in Helsinki was followed by sixth place in the defence of his Olympic title. Another big name out of the medals in 2012 was Germany’s 2011 World Championships gold medallist Matthias de Zordo, who had persistent injury problems. 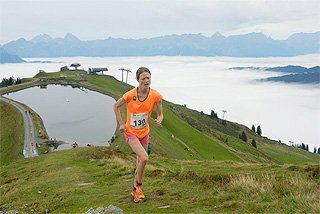 Four countries are tied for the top spot in this event with Finland, Germany, Poland and United States all having eight athletes in the world top 100. However, in London, Ostapchuk had four puts over 21 metres while Adams best was 20.70m and the gold medal was initially awarded to the Belarus thrower before Ostapchuk, a week later, was disqualified for a doping violation. Retroactively announced as Olympic champion, Adams went on to win her five remaining competitions in Stockholm, Lausanne, Birmingham, Zurich and Rieti by huge margins of more than a metre and sometimes two metres. Adams is consistently going beyond 20.50m but other 20-metre marks were quite rare this year. 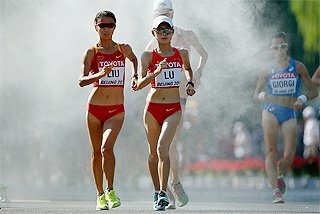 The only two others managing this distance - other than Ostapchuk prior to her disqualification - were Russia’s Yevgeniya Kolodko and China’s Glong Lijiao. Of this pair, Gong seems to have levelled off in her progress as this was her fourth year in a row with an annual best between 20.11m and 20.35m. Looking at the pattern of progress in recent years, the Olympic silver medallist Kolodko looks more likely to be able to develop into a challenging opponent for Adams. After reaching 15.38m in her last year as a junior in 2009, the 22-year-old has improved by over five metres: 16.73m in 2010, 19.78m in 2011 and now 20.48m in 20.12. The event has been dominated by a few nations for many years and in 2012 no less than 17 of the top 25 were from just five nations: Russia, Belarus, China, USA and Germany. Historically, many top Discus Throwers seem to able to stay competitive not just for years but for decades. Obviously technique and experience are key assets like in no other event. With this background, it is quite remarkable that this event was almost completely dominated in 2012 by a thrower aged just 22: Croatia’s Sandra Perkovic. 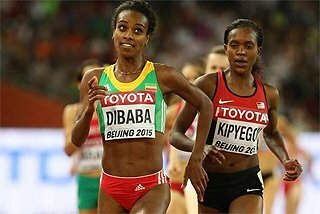 She compiled an almost perfect season only losing once and, getting Olympic and European titles as well as being a runaway winner in the Diamond Race. The only small blemish on that record was a loss by 35 centimetres to Australia’s 2009 World Championships gold medallist Dani Samuels at the Paris Diamond League meeting. Otherwise, Perkovic convincingly won all her other six Diamond League competitions. 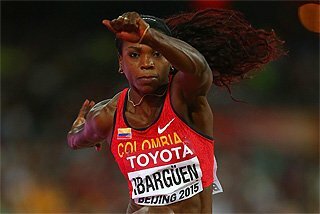 She also hit her very best mark of the year, 69.11m, in the Olympic final. However, Perkovic is not heading the 2012 world list as Russia’s Darya Pishchalnikova sent her discus out to 70.69m at the Russian Championships at Cheboksary in early July. 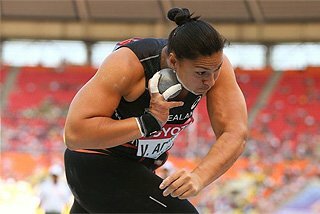 The current top echelon of female discus throwers also includes China’s Li Yanfeng Germany’s Nadine Müller and Cuba’s Yarelis Barrios. This trio took the three medals at last year’s World Championships and this year occupied places three to five in the Olympic final, and were also showing consistent form throwing over 65 metres regularly. Samuels won the 2009 World title in Berlin at the age of 21 but has not yet been able to build upon that success, despite being the only woman to defeat Perkovic. She did reach the Olympic final but never was a contender for the top positions and finished 12th. With Perkovic, Müller and Samuels all having tasted considerable success at major youth and junior championships, there is obviously a good correlation between success in these ranks and then later as a senior. This bodes well for Germany’s Anna Rüh and Shanice Craft, who finished one and two at the 2012 World Junior Championships and can both boast of best marks around 63 metres. Rüh even contested both the major senior championships, finishing fourth at the European Athletics Championships and 10th at the Olympics. There is no doubt who the current top three are: Tatyana Lysenko, Betty Heidler and Anita Wlodarczyk. This trio have alternated as the world record holder, with Heidler being the incumbent at the moment, for the last six years. Between themselves, they have also taken seven out of the eight major titles at stake from 2006 onwards: Lysenko, the 2006 Europeans, 2011 Worlds and 2012 Olympics; Heidler, 2007 Worlds and 2010 Europeans; and Wlodarczyk, the 2009 Worlds and 2012 Europeans. If any further proof was needed of them being the ‘Big Three’, they also swept the podium in London where little more than a metre covered them. Perhaps Heidler could be said to be the most consistent of them due to the regularity of her throwing beyond 75 metres, but she had a disaster at the European Athletics Championships and missed the final with only 65.06m in the qualification round. Wlodarczyk got her best result of the year in the Olympic final, just like she did at the 2009 World Championships with what was then a world record. However, Lysenko still seems to be the best at rising to the occasion. Last year Heidler was the overwhelming favourite to take the world title but Lysenko still won and in the Olympic final, the Russian was leading all the way after opening with 77.56 and improving to 78.18 in the fifth round. Somewhat surprisingly, the statistical top position for 2012 doesn’t belong to any of these three but to Belarus’s Aksana Menkova with 78.69m. Menkova actually had three competitions over 78 metres but all of them were on home soil without facing any international opposition and the Beijing 2008 champion was never was a factor in London, ending up seventh with 74.40m. The fifth woman over 77 metres this year, Gulfiya Khanafeyeva, fared badly in London and didn’t even reach 70 metres in the Olympic qualification round. By contrast, consistency in a championship situation was once more proved by China’s Zhang Wenxiu, Germany’s Kathrin Klaas and Cuba’s Yipsi Moreno who ended up in fourth to sixth place, which broadly matched the pre-Olympic predictions. All of them had yearly bests set on foreign soil. In London, Zhang missed her 2012 best of 76.99m by just 65 centimetres; Klaas improved her mark from South Africa by almost a metre to a personal best 76.05m and Moreno was less than a metre from her 75.59m set in France. Experience is apparently of significance in the Hammer Throw as the top six in London were all between 26 and 32 years of age and only one thrower born in the 1990’s managed to reach the final. Just like in the Hammer Throw, this event has a quite small group of throwers that have dominated the event at recent championships. Here this group consists of Czech Republic’s Barbora Spotakova, Germany’s Christina Obergfoll and Russia’s Mariya Abakumova. Spotakova has the most impressive medal collection with three golds, three silvers and one bronze collected between 2006 and 2012 while Obergfoll has been the most consistent with no less than nine top five finishes, but has found that illusive gold medal had to come by. Abakumova has been more erratic but she still has a complete set of medals, topped by the 2011 World Championships crown to show for her efforts. 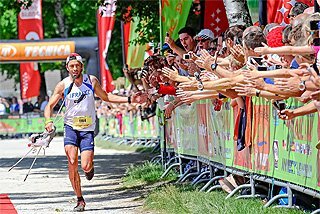 In the last seven years, this trio they also have held the number one position every year: Abakumova three times, Spotakova and Obergfoll twice each; the number two position every year but one (2012) and the number three position every year but two (2006 and 2007). The most significant challenge to their cartel has been made by South Africa’s Sunette Viljoen, who has raised her game considerably in the last two years. However, the ‘primus inter pares’ in this elite group in 2012 was still definitely Spotakova who defended her Olympic title from Beijing by producing the best mark of the year, 69.55m. She didn’t win all the time but she never finished lower than second at any time, including at all seven Samsung Diamond League meetings. Spotakova also had a overwhelming advantage in consistency at the top distances as well, with three competitions over 68 metres and seven more over 66 metres. The corresponding numbers for the others were 1-2 for Viljoen, 0-2 for Obergfoll and 0-1 for Abakumova. It’s clear that Spotakova’s absence in 2013, to become a mother, will leave a big void at the top of her event. With Obergföll and Viljoen now in their thirties, the most likely to take over the number one position should be Abakumova. However, the Russian had a disappointing 2012 after a promising start in May, when she beat Spotakova and Obergfoll at the Diamond League meeting in Doha. The Olympic final became a true disaster for her as she had to settle for 10th place after not even throwing beyond the 60 metres. 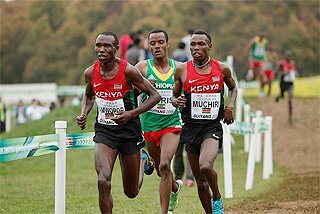 With the top group having dominated so thoroughly for almost two Olympic cycles, it is inevitable to ask the question whether there is a new generation getting ready to take over. The most obvious name to mention is Ukraine’s 23 years old Vera Rebryk, who compiled an impressive set of medals during her youth and junior years and she is still the World junior record holder with her 63.01m from 2008. This year, Rebryk won the European title ahead of the German pair of Obergfoll and title defender Linda Stahl with a personal best of 66.86m but, just like for Abakumova, the Olympics provided a big disappointment for Rebryk who did not even advance to the final. Looking further down in age, the outstanding name is Sweden’s Sofi Flinck who, at the age of 17, shocked just about everyone at the World Juniors Championships in Barcelona. Coming into the meet with a best of 54.85m, she produced a Swedish senior record of 58.16m with her very first throw in the qualification. In the final, Flinck was back in third place going into the final round but exploded on her last attempt and the javelin flew all the way to 61.40m. Within two days Flinck, who didn’t exactly come from nowhere as she had grabbed the silver medal at the 2011 World Youth Championships, had improved by more than six- and-a-half metres!